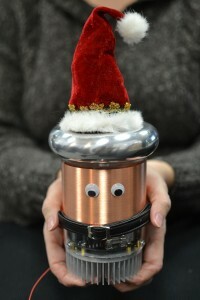 Tesla coil kits make great gifts! Last call for Christmas orders! - Deadline extended! Order the oneTesla Musical Tesla Coil Kit by midnight tonight (11:59PM on 12/16/2014) to receive your kit in time for Christmas. Don't forget to choose Priority Mail shipping! Order now. Stock is very limited! Pre-order oneTesla TS and tinyTesla today! And don't forget about the pre-soldered tinyTesla kit and the SD card interrupter kit, which are also available for pre-order. Check out this video of the SD card interrupter in action.